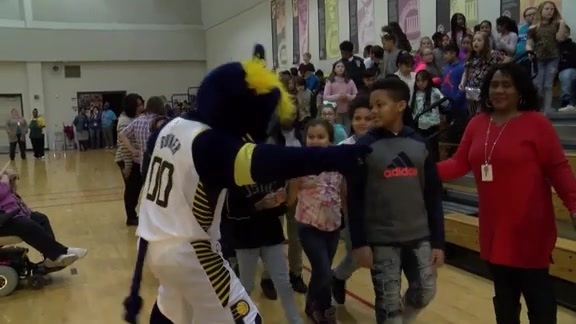 Dec. 20, 2018 - Pacers Sports & Entertainment made its final stop stop on the ninth annual JAKKS Pacific Holiday Toy Giveaway in Seymour. 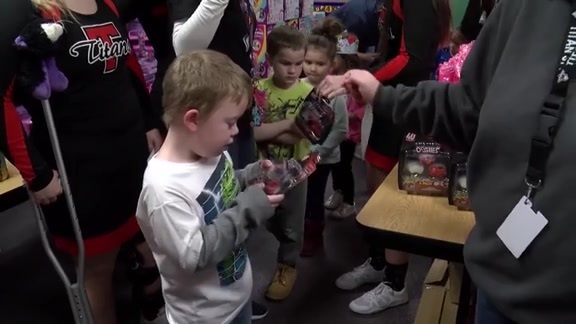 Dec. 19, 2018 - Pacers Sports & Entertainment made a stop on the ninth annual JAKKS Pacific Holiday Toy Giveaway in Terre Haute. Dec. 14, 2018 - Pacers Sports & Entertainment made a stop on the ninth annual JAKKS Pacific Holiday Toy Giveaway in Fort Wayne. Dec. 13, 2018 - Pacers Sports & Entertainment made its next stop on the ninth annual JAKKS Pacific Holiday Toy Giveaway in Anderson. 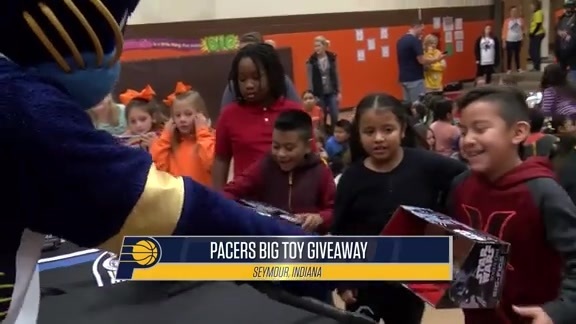 Dec. 7, 2018 - Pacers Sports & Entertainment tipped off the ninth annual JAKKS Pacific Holiday Toy Giveaway in Kokomo. INDIANAPOLIS – For the ninth consecutive year, JAKKS Pacific Toy Company Chairman & CEO Stephen Berman and his company are providing Pacers Sports & Entertainment a major toy donation for distribution to Hoosier children. Berman, a close friend of PS&E Owner Herb Simon, and JAKKS Pacific, one of the leading U.S. toy companies, will be providing toys to more than 50 youth-serving non-profit organizations throughout Indiana. The donation is part of the annual Pacers and NBA Season of Giving initiative. 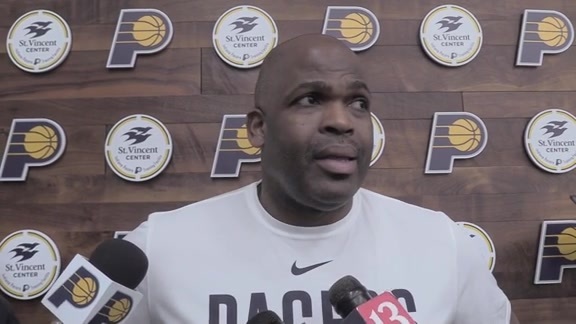 Beginning Friday, the Indiana Pacers and Indiana Fever through their Pacers Cares and Fever Cares programs will tip off a state-wide distribution by joining local police departments in donation ceremonies in Kokomo, Anderson, Richmond, Fort Wayne, Terre Haute. Seymour and select sites in Indianapolis. In Fort Wayne, the toy distribution will be in partnership with the Mad Ants, the Pacers' NBA G League affiliate. Pacers mascot Boomer, Fever mascot Freddy Fever, Pacemates and Pacers front office staff will accompany each visit. In Indianapolis, the Pacers and Fever are again partnering with the Indiana National Guard in the distribution of toys to local agencies. The toy giveaway will be highlighted on Wednesday, December 12 when the Pacers host Milwaukee at Bankers Life Fieldhouse. There, Berman, Simon, NBA Commissioner Adam Silver and members of both teams will participate in a toy distribution during pre-game and in-game festivities. "For almost a decade now the children of Indiana have been the recipients of Stephen’s continued generosity," said Pacers Sports & Entertainment President and COO Rick Fuson. "It's hard to imagine how many children, families and youth-serving organizations have had their holidays brightened because of this man." The holiday toy giveaway is part of the Pacers Cares and NBA Season of Giving, which includes other holiday events such as the "Come To Our House" Thanksgiving Dinner presented by Pacers Thad Young and Victor Oladipo, US Foods and PS&E; "Shop With The Pacers" presented by Circle Centre Mall; and a PS&E Day of Service with volunteers packing more than 75,000 meals for Gleaners Food Bank, with support from Pacer Cory Joseph.